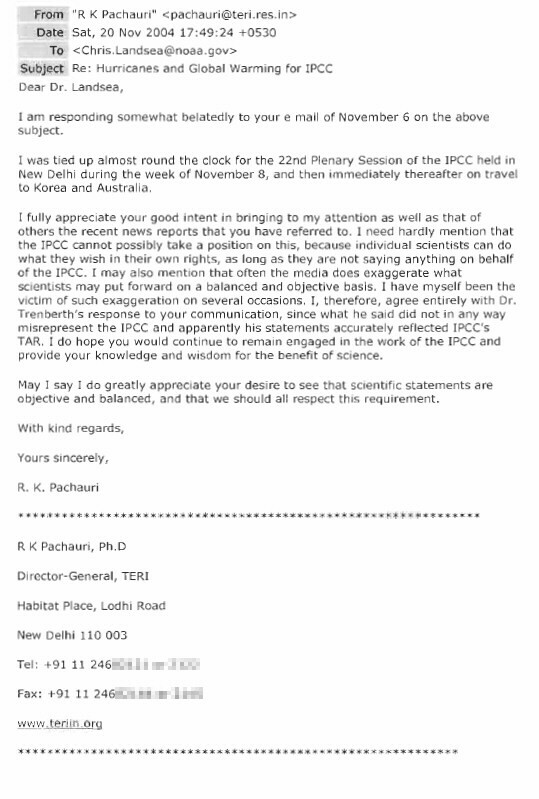 Pachauri used TERI email account to conduct official IPCC business | Watts Up With That? Looking at something else entirely unrelated today, hurricanes, I stumbled upon Dr. Pachauri’s intertwining of his work for TERI and the IPCC when I was given a link by a WUWT commenter John from MN to Dr. Christopher Landsea’s (hurricane expert, chief scientist at the National Hurricane Center) discussion of why he resigned. It seems Pachauri and others weren’t paying any attention to the science he was presenting that showed no link between global warming and hurricanes. See here for NOAA’s press release on Landsea’s benchmark paper breaking any such imagined linkage. Here is the open resignation letter from Dr. Landsea from January 2005 as posted on Dr. Roger Pielke Jr’s older “Prometheus” blog. With this open letter to the community, I wish to explain the basis for my decision and bring awareness to what I view as a problem in the IPCC process. The IPCC is a group of climate researchers from around the world that every few years summarize how climate is changing and how it may be altered in the future due to manmade global warming. I had served both as an author for the Observations chapter and a Reviewer for the 2nd Assessment Report in 1995 and the 3rd Assessment Report in 2001, primarily on the topic of tropical cyclones (hurricanes and typhoons). My work on hurricanes, and tropical cyclones more generally, has been widely cited by the IPCC. For the upcoming AR4, I was asked several weeks ago by the Observations chapter Lead Author – Dr. Kevin Trenberth – to provide the writeup for Atlantic hurricanes. As I had in the past, I agreed to assist the IPCC in what I thought was to be an important, and politically-neutral determination of what is happening with our climate. My concerns go beyond the actions of Dr. Trenberth and his colleagues to how he and other IPCC officials responded to my concerns. I did caution Dr. Trenberth before the media event and provided him a summary of the current understanding within the hurricane research community. I was disappointed when the IPCC leadership dismissed my concerns when I brought up the misrepresentation of climate science while invoking the authority of the IPCC. Specifically, the IPCC leadership said that Dr. Trenberth was speaking as an individual even though he was introduced in the press conference as an IPCC lead author; I was told that that the media was exaggerating or misrepresenting his words, even though the audio from the press conference and interview tells a different story (available on the web directly); and that Dr. Trenberth was accurately reflecting conclusions from the TAR, even though it is quite clear that the TAR stated that there was no connection between global warming and hurricane activity. The IPCC leadership saw nothing to be concerned with in Dr. Trenberth’s unfounded pronouncements to the media, despite his supposedly impartial important role that he must undertake as a Lead Author on the upcoming AR4. It is certainly true that “individual scientists can do what they wish in their own rights”, as one of the folks in the IPCC leadership suggested. Differing conclusions and robust debates are certainly crucial to progress in climate science. However, this case is not an honest scientific discussion conducted at a meeting of climate researchers. Instead, a scientist with an important role in the IPCC represented himself as a Lead Author for the IPCC has used that position to promulgate to the media and general public his own opinion that the busy 2004 hurricane season was caused by global warming, which is in direct opposition to research written in the field and is counter to conclusions in the TAR. This becomes problematic when I am then asked to provide the draft about observed hurricane activity variations for the AR4 with, ironically, Dr. Trenberth as the Lead Author for this chapter. Because of Dr. Trenberth’s pronouncements, the IPCC process on our assessment of these crucial extreme events in our climate system has been subverted and compromised, its neutrality lost. While no one can “tell” scientists what to say or not say (nor am I suggesting that), the IPCC did select Dr. Trenberth as a Lead Author and entrusted to him to carry out this duty in a non-biased, neutral point of view. When scientists hold press conferences and speak with the media, much care is needed not to reflect poorly upon the IPCC. It is of more than passing interest to note that Dr. Trenberth, while eager to share his views on global warming and hurricanes with the media, declined to do so at the Climate Variability and Change Conference in January where he made several presentations. Perhaps he was concerned that such speculation – though worthy in his mind of public pronouncements – would not stand up to the scrutiny of fellow climate scientists. In that link that Dr. Landsea provided, we find his record of correspondence, which is a matter of public record since it was conducted with U.S. Government agencies. There’s no FOIA needed to get these emails since he made them public 5 years ago almost to this day. One of the emails had a response from Pachauri to Landsea, discussing IPCC related issues that led up to Landsea’s resignation. Here’s a screencap of the letter from the PDF above. Note that I joined two pages to make a complete document and smudged out the phone number, but left it otherwise intact, including the email address used by Dr. Pachauri. What I find most interesting, is that Dr. Pachauri doesn’t use an IPCC or UN email address, but instead is using his account at TERI to conduct official IPCC business. With the concerns being raised over conflicts of interest, it would seem that at least in this case, there is no distinction from Dr. Pachauri on where his private enterprises end and his public office begins. They are hopelessly merged together in this document. Contrast that to all of the other email addresses listed in another document from Landsea that was cc’d to a number of familiar faces in the current Climategate debate. At least they all use government or university addresses. Dr. Pachauri’s email address as head of the IPCC is vastly different from all of the other players that have lesser titles in a government or university organization. They all seem to use their government or university email addresses for such official business, as would be normal and expected. It seems really odd to me then, that the chairman of the IPCC, a body of the United Nations, would be using an email address from another organization he is the director-general of (TERI) to conduct official IPCC business. By itself it is a small thing, but in the context of recent claims made by Pielke Jr, Booker, and North of conflicts of interest, it does seem to fit the pattern they claim; that Dr. Pachauri hasn’t been separating himself from what is public governmental business and what is private business. January 18, 2010 in Climategate, IPCC. Is the “William Connolley” who heads the comments concerning the resignation letter on the Prometheus blog posting the same guy we know and love at Wikipedia? …how it botched it’s fourth IPCC assessment report (AR4) in 2007 with the inclusion of non peer reviewed speculation of glacier melt by 2035 in violation of its own standards of practice…. …Dr. Christopher Landsea’s (hurricane expert, chief scientist at the National Hurricane Center) discussion of why he resigned. It seems Pachauri and others weren’t paying any attention to the science he was presenting that showed no link between global warming and hurricanes…. I have been utterly negligent in not reading the Fourth Assessment of the IPCC, but there is only so much blather I can handle. However, there must be dozens places in the IPCC where the peer-review was not worthy of the title. For instance, by searching the notorious UEA e-mails I see that borehole temperature proxies were included to help bolster other proxies. Pathetic. This data can tell us only what the surface temperature record already shows, but at much worse time/temperature precision–and that’s only if it is all measured and analyzed properly. I do not trust the contributors to the IPCC to have done so well. Total disbelief. So I guess the Surgeon General, as long as he says he isn’t speaking as the Surgeon General could say the smoking is good for you and everyone is somehow supposed to separate that statement from official Surgeon General statements? Most of us skeptics believed for a long time that these people were/are a bunch of crooks serving self interest. “Move along folks, nothing new here, move along”. Nothing new but damn important and interesting. Didn’t Trenberth mimic this hurricane story in testimony before the Senate, when Boxer accused Spencer of being Limbaugh’s favorite just a year or so ago? Can’t seem to find anything on that. I have been doing some thinking about model instability. The models show a gain of 1.5 to 4. With that much gain the system has to get driven to a rail once you are past the tripping point. Uncontroversial. So how do the modelers get around that? Lags. They claim the e-folding time is on the order of 100 years. And what do they do? Cut off reporting model results at 100 years. If the real e-folding time is 5 or even 10 years the models with blow up in such a way that it is obvious to the meanest intelligence. 20 e-foldings = 0.9999999979 (aprox) of the final value in 100 years. 10 e-foldings = 0.9999546000 (aprox) of the final value in 100 years. 1 e-folding = 0.6321205588 (aprox) of the final value in 100 years. I wonder if the above is the origin of heat in the pipeline? For comparison it takes 2.3 e-foldings to get to 90% of the final value. Which is 11.5 years for a 5 year lag and 23 years for a 10 year lag. Any way – by playing with the lags they can cover up model shortcomings. And so it grows. Follow the dollars, always follow the dollar trail. Shouldn’t the title be “Landsea used NOAA email account to conduct official IPCC business”? Chris Landsea. My sincere respect. Someone with Integrity. Notice that Pielke Jr. also points out that the bad glacier date came from someone who was later hired by TERI. Double take………. I see I read the date incorrectly on the email and it was 2005 not 2009. My bad……..Sincerely, John. It just keeps getting better and better (or worse and worse, depending on relative perspective). I’m not too bent out of shape over Pachauri using his work address for IPCC business. I don’t know what the structure of the IPCC is. If it’s a full time job and the chair is expected to be in New York, that’s one thing. If it’s parttime work then permission of employer is all that’s necessary. All the people Landsea sent his Email to are likely IPCC member doing a parttime job, likely with permission from their employers, likely with encouragement, and likely on company time (or grant, or something supported by the employer). On the network protocol committees I’ve been on, the structure is extremely informal – I can’t point to a start or termination date. I was never very active, but my employers paid for travel to meetings and I could use other corporate resources like Email for that work. 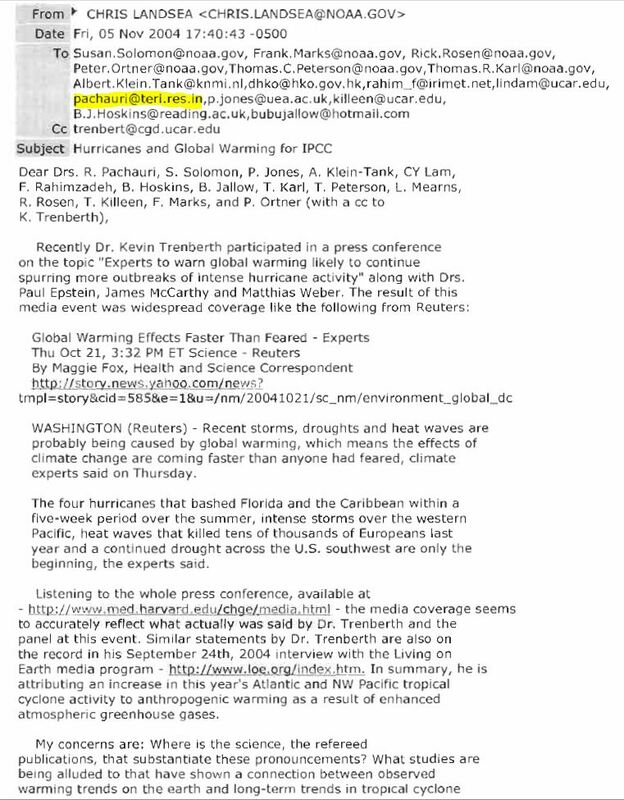 Had the IPCC had members like Heidi Cullen when she was at the Weather Channel, she would have likely used a weather.com Email address. In someways it’s disappointing that the IPCC core are academics and gov’t agents. On the other hand, I’m a lot more concerned about the conflict of interest between Teri and the IPCC. It’s one thing for the Weather Channel or Accuweather to take an interest, it’s another thing when solar panel or wind turbine manufacturers or Teri’s “Our work touches the lives of Millions and embraces every significant aspect of Sustainable Development” join in hopes of directing the agenda and business their way. With webmail and with POP3 clients that work anywhere, it seems incredible that he’d need to resort to his business email account. Since he’s conducting official IPCC business, why use an unofficial email channel? and he is introduced as the Surgeon General, of course…. Since the date is 5 years ago it is not quite so damning as I originally thought. Yes wrong is wrong, but as far as the Hurricane report being pumped up after Chris’s research did not agree, it would have been much larger if it was last November rather than 5 years ago. But Anthony’s take on Pachauri is a differnt issue…….Sincerely, John…. 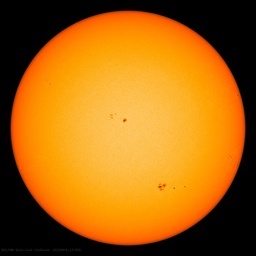 I’m pretty sure that our fears of global warming will melt away waa..ay before 2035!! I remember reading Landsea’s resignation letter a few months ago and my feelings have not diminished in the respect I have for his ethical stand. Can I just say that while the IPCC and certain other elements of the UN deserve condemnation, the whole institution is not irredeemable? I’ve dealt extensively with he UN World Heritage Comitee and they hard working, honest and reliable. It may have something to do with the woefully inadequate budget they have, the workers haveto care about the worlds natural and cultural heritage more than money. Do these guys ever stay put on one continent for more than a couple of weeks at a time? I wonder how much jet travel they do in a year. For the sake of clarity, it should be noted that “TERI” stands for The Energy and Resources Institute. The corporation’s Annual Report 2008/09 carries the Institute’s most recent complete financial statement, and provides some very interesting reading. Pachauri’s letter is the work of a snake, if you don’t mind me saying so. Self dealing is not corruption in the UN, It is the normal activity. this is just the latest to become generally known. Just what part of UN corruption is not normal? everyone does it. Only a few get caught and most of them get to retire with their gains and a large pension. They also become well connected to the Oligarchy for additional riches. Perhaps in the Next Age we will start over and replace the UN with something better thought out. such an interesting time we live in. What is damning is the way this man’s contribution was treated by ‘Travesty’ Trenberth which WAS a travesty. And also subsequently by Pachauri’s mealy mouthed response to him in the emails. The point is that this seems indicative of the way they conducted the business of the IPCC even to people who were assisting them. Their level of credibility is demonstrated in these emails. Nothing will have changed. It matters not that it was 5 years ago or yesterday. It matters not that it was huricanes or co2 or anything. They manipulated data to fit the story they were peddlng. Perhaps the good Dr was using a private email in order to prevent some of his emails from falling under FOI requests. Using an unofficial email account to conduct official business sounds like being up to something. Covering tracks, moving behind the scenes, side deals, getting people to talk ‘off the record’ as a lure, and doing IPCC business that you wouldn’t want the world to know was going on. At the very least, it’s something that says “Dig here, dig now”. Myron M: You have a good point about the Surgeon General. re the Pachauri emails. The usual complaint is that an official has used public assets for private purposes. But here the complaint seems reversed, Pachauri used private assets, TERI, for IPCC business. Odd. And by itself an email expense would be a small thing. But with Pachauri there seems to be a pattern. Clearly Pachauri has a great conflict of interest by any normal standards. I am not sure normal standards apply at the UN. Does anyone know what happened to Chris Landsea after this? Opposing the “cartel” was not a good career move — and I hope he did not suffer unduly. Time is running out for the IPCC. Either they come clean or heads must roll, if not go to jail. Is it possible that the PDF-file is somewhat “corrupted”? It seems certain pages or part of pages are missing and the sequence of the pages sin’t logical to me. From what I’ve learned about the participants in this polluted Panel (and its process) in the last few months, it seems to me that this pattern of throwing integrity and ethics to the wind – while dismissing/denigrating any criticism that might detract from “the message” – may well be one of the unwritten “principles” of the organization. Not to mention, of course, of those Laudable Lead Authors, e.g. Trenberth, Briffa et al. I believe he was that before during and after his IPCC involvement. IIRC, a comment here last year referred to the commenter’s son who was working with Landsea on the project. Hmm, I doubt I can find it – use the search tool at the top and search for Landsea – he’s keeping very busy in his post IPCC days. Ric Werme (19:16:44) : Had the IPCC had members like Heidi Cullen when she was at the Weather Channel, she would have likely used a weather.com Email address. In someways it’s disappointing that the IPCC core are academics and gov’t agents. And if she did not have a written permission or similar to do so, could find herself with a “repremand” for using corporate resources for private purposes. Typically, for example, and Engineer serving an an IEEE committee will have some approval from their boss to attend and participate, this constitutes tacit approval. Even with such approval, if, for example, said engineer was working to get a standard approved that could only be supplied by their company and they stood to gain a bonus for doing so, this would, at minimum, violate most ethics standards and could open them to a conflict of interest charge. Bottom line is that it is very easy to have a private account and keep things apart. To not do so is just stupid. On many client sites I set up “neutral zones” or “DMZ” zones where visiting consultants and contractors could be placed at work stations and have selected access to internal facilities (servers, email) while not being free to roam “on” the corporate network; yet still able to connect to their corporate private networks as though they were “back at the office”. At one site we had close to a dozen such “dmz” offices. Engineers, at least, are very familiar with doing this (in order to meet corporate security policies). On the other hand, I’m a lot more concerned about the conflict of interest between Teri and the IPCC. I;…]Teri’s “Our work touches the lives of Millions and embraces every significant aspect of Sustainable Development” join in hopes of directing the agenda and business their way. BINGO. Blatant conflict of interest. One of these two organizations likely has a few policies that are being violated. Further, I’d expect email originating from Teri to support a claim of “working a public agency for personal financial gain” and “influence pedaling”. REPLY: You make some reasonable points, let me explain why it seems odd to me. When I was on my local school board, I traveled all over the United States, plus abroad, and I used the Unified School District Email address for all official correspondence, no matter where I was. BTW, one LEGAL reason to keep them disjoint. If, say, a suit is brought against Teri. Now his email address being used for the UN communication means all that UN correspondence can be asked for as part of “discovery”. And folks wonder why I’m not keen on email… Do you REALLY want “discovery” to put you on the stand explaining why somebody is sending you pictures of the stripper bar he’s inviting you to attend? NEVER put personal stuff in email. Ever. And double never put it in corporate email. So if anything starts to stick to Pachauri in either role, all his email at both places will now be gone over by a team of lawyers. Thank you for your above comment. It gives me hope that this debacle will eventually be fully investigated. Its a lot, saw the figure for Pachauri somewhere but can’t remember the value, when you consider all the retoric you get rammed down out throats daily on reducing your Carbon footprint its perverse. And all greenies fall for this. Having read the climategate emails, I had put Mann, Santer and Jones as the three top fraudsters, the gang of three. I have now elevated Trenberth into that elite league, which is now the gang of four. Of course it is difficult to sort out the leaders from the followers, i.e. where does one put Schneider, Hansen and all the others? Some are clearly worse than others. Check out what TATA are doing to tribespeople in Orissa Eastern India with their drift mines and steelworks and you’ll start to get a clue about just what a self serving hypocrite Pachauri really is. I think of this bit every time I think of what the IPCC sells. Has anyone noticed, Arctic temperature is heading for absolute zero (see http://ocean.dmi.dk/arctic/meant80n.uk.php )! Once it reaches about 10K, superconductivity comes into play! Grotesque ice monsters exhaling dry ice (carbon dioxide) mist will form and devastate civilization! Giant icy feet will be our end! Oh, the humanity, the CRU-Mann-ity! Teri’s annual report makes interesting reading. No balance sheet, no income statement, and no public disclosure of salaries/earnings of directors/senior executives. Anywhere in the real world, that’s the minimum basic disclosure requirement. Presumably there is a need to know list and we don’t need to know. However, lots of waffle and pictures of Mr Pachauri to keep the faithful happy. Christopher Landsea cc’d Pachauri at his TERI email address and so there is nothing wrong or strange about Pachauri answering from that address. We don’t know what private arrangement were made between the two about important communications. Christopher Landsea, was a research meteorologist with Hurricane Research Division of Atlantic Oceanographic & Meteorological Laboratory at NOAA. His contribution to the IPCC report was as a NOAA employee and so it is fitting that he use NOAA facilities to officially withdraw from the assessment. I skimmed through the TERI Annual Report mentioned above and noticed that a certain Prof. Syed Iqbal Hasnain, Senior Fellow, WRPM, Water Resources Division ‘was conferred the Padma Shri for his research on Himalayan glaciers. Prof. Hasnain received the award from the Hon’ble President of India, Smt. Pratibha Patil. – isn’t this the very man who made the the Himalayan glacier disappearance phone call to New Scientist? ” It has also emerged that the New Scientist report was itself based on a short telephone interview with Syed Hasnain, a little-known Indian scientist then based at Jawaharlal Nehru University in Delhi.”. Little wonder that Pachauri was not happy with any criticism of this man…. When will the lawyers make a start on all of this ? True. And the colder it gets, the slower the ice grows (JAXA, Nansen). “Total disbelief. So I guess the Surgeon General, as long as he says he isn’t speaking as the Surgeon General could say the smoking is good for you and everyone is somehow supposed to separate that statement from official Surgeon General statements? Another video of Monckton predicting that Pete the poaching Puma, uh, I mean Patchauri the con man is going to jail for fraud. Yes. He should be holding up a prison number, to make the image complete…. I often wonder if I am alone in trying to get my head around the profoundly depressing implications of the incremental decimation of the institutions who have previously held ‘popular respect’ – UN, IPCC, BBC, NASA, the press, banks et al. Perhaps this is simply the way society has always worked. I suspect folk coming around to Galileo’s way of thinking ‘back in the day’ had similar sleepless nights. I posted an entry on my own blog about the inherent conflict of interest last week. I was clued into this several years ago by someone I had a conversation with at a bar outside of MIT. He said he was a climate researcher whose work rebuffed most of the claims of anthropogenic climate change. Unfortunately, he couldn’t get his work published nor could he get additional funding. His take on it was that there was too much money being invested in “global warming” and that anyone who rocked the boat would disrupt that flow. I really wish I had got his name because everything points to him being dead-on about the current information coming out. We need a side-profile shot next to the front-face shot. This really should be considered criminal behaviour, in no uncertain terms. The man has blurted unfounded misinformation to the world’s media in his capacity as IPCC Chairman, and has misrepresented the findings (or non-findings) of scientists. Sadly, none of this is anything new, and is typical of IPCC behaviour. Chris Landsea has my utmost respect for acting on his principles. I only wish there were many more like him – the IPCC would collapse like a house of cards. Pachauri to completely disappear by 20:35 or even sooner. Indeed! We have gone to zonal flow since about January 10 or so, and it has been damned pleasant here in the U.S.. But this means the polar region is cut-off from a supply of warm southerly flowing air and becomes absolutely frigid. Soon we will go back to meridional flow, and then, look out Gulf Coast again. Searching through the CRU emails for “teri.” reveals a large number of entries including “chairipcc@teri.res.in” in March 2006 and “pachauri@teri.ernet.in” or “pachauri@teri.res.in” several times. According to this story, it’s OK for Dr. Trenberth to make ‘controversial’ statements linking hurricane activity to warming trends despite an official IPCC line to the contrary. OTOH, Georg Kaser, a tropical glaciologist at the University of Innsbruck and an IPCC ‘lead author’ is now claiming that he warned colleagues about Himalayan glacier howlers back in 2006, noting that, ‘This number is not just a little bit wrong but far out of any order of magnitude. It is so wrong that it is not even worth discussing’. Asked why his was over-ruled, Kaser apparently cited “a kind of amateurism” among experts from the region who were in charge of the chapter on climate impacts. “They might have been good hydrologists or botanists, but they were without any knowledge in glaciology,” he said. Recent events suggest that India does not lack competent glaciologists. It probably never did. Quite apart from Pauchari insulting an Indian government minister and calling the work of a senior glacier expert ‘voodoo science’, the best part of a billion people were warned that they were at risk of severe water shortages within a generation. The warnings sparked a round of campaigns, press discussions, general hullaballoo and much concern. Under the circumstances, so they should have. So, if Trenberth can break ranks and propagate nonsense with impunity and Dr Landsea (greatly to his credit) feels impelled to respond by resigning, why did Georg Kaser not resign and/or tell the world at large that the glaciers story was hokum three or four years ago? Is it just me being picky or is there a whiff of moral cowardice in the air? The AGW fight is starting to look like a Pro-Wrestling tag team match. Mann-Child just tagged in The-Amazing-Pachauri after he got suplexed by Masher-Mosher… only to have Mega-Watts clock Pachauri with a folding chair. It occurred to me that for subjects areas where Landsea is the expert, he could see that the IPCC data was wrong. And where Kaser is the expert, he could see that the IPCC data was wrong. How many specific areas of the IPCC reports are known to be wrong by their respective experts, while these exact same experts make up the “consensus” as they assume that ALL OTHER AREAS of the reports are correct? Dave B (06:58:13) : Perhaps, financial cowardice may be more appropriate. Being a family man, my source of income is crucial to the health and welfare of my family. Many (most) will keep their head down and fly under the radar to keep the gravy train a rollin’. Weighed against “doing the right thing”, it is understandable that people will not choose the moral high ground and continue to feed the family. Personally, I try to look a little further down the road and see the dangers inherent in not speaking out about the false theory and the draconian measures this theory will bring. Most have no clue what” cap and trade”will do to their daily lives, while doing nothing for the environment. In fact, the general public have not even associated “cap and trade” with “climate change”. Ask those around you if they understand what “cap and trade” is about. My guess is you will see a lot of blank expressions, and they will put their heads down and keep working. Can anyone explain why the curves at the end of any one year seems to be only loosely related to the curve at the start of the following year? 1999-2000 is a particularly odd case – an 18C overnight jump. Was this perhaps due to the fireworks used at Millennium parties? New York Times: E. Rosenthal – Trying to have it both ways. “Studies indicate that by 2030 another 30 percent will disappear; by 2050, 40 per cent; and by the end of the century 70 per cent,” quoting Y Tadong – a Chinese glaciologist. That’s why we need an international effort.” [Meaning “give us more money]. While reading the Telegraph piece just now, I noticed another one for today. Under Headline: Millions of pounds of British taxpayers’ money is being paid to an organisation in India run by Dr Rajendra Pachauri, the controversial chairman of the UN climate change panel, despite growing concern over its accounts. Interesting reading, like a “Part 2” of the story above. The UK Daily Express, as will have been noted :), is stepping up. Generally in the tabloid camp I guess but nevertheless doing some digging. Here are two snippets that may add to this subject. and this one perhaps goes some way to explain the financing of the rentacrowds that spawn around the likes of the Copenhagen beanfest. Note on the article I mentioned [kadaka (08:51:55)], I noticed it in the “Earth Most Viewed: Today” section. Technically it was published earlier than the piece mentioned in the above WUWT piece. Can someone explain the logic of the end of the article? Money is paid to TERI. TERI pays money to Pachauri. Money paid to TERI is not received by Pachauri directly or indirectly. Not at all Peter. Neither our dear politicians nor MSM wants to hear or see what is going on. Fraud after fraud after fraud, all of them well documented are explained away as being “a manner of speaking, an honest mistake which does not alter anything, of no importance” since: “99% of all scientist in the world agrees that global warming is serious/frightening/the doom of human kind – so such minor errors are totally unimportant”; just take your pick. UN/IPCC, Penn State and CRU will protect their people by doing their own investigations and mislead both MSM and politicians as to what is happening and no politician will, for now, admit that the billions and billions of taxpayers dollars spent so far has given absolutely no result. It will take years and years and it will cost us plenty in totally unnecessary policies and laws which will not change anything as regards to climate before the thruth really is known to a majority. But we can hope, that this is the end of the beginning. “It occurred to me that for subjects areas where Landsea is the expert, he could see that the IPCC data was wrong. I believe that Dr. Paul Reiter, the IPCC expert on mosquito and malaria, found that the IPCC report was flat out wrong in that area, and resigned from IPCC. He even had to threaten with law suit in order to have his name removed as an IPCC “contributor”. Also, the worlds leading expert on sea-level rise, Dr. Nils-Axel Mörner, found that the IPCC was flat out wrong in that area, and indeed that it had no real sea-level experts in WGI at all. It would appear that the IPCC in major areas of physical climate science bases its conclusions on preconceived non-science. No idea, wondered that myself. Perhpas I will write them to asl why. Yikes! I mangled that sentence. Ouch.